Sales enablement, also known as the sales readiness, is the process which enables the salesperson to speak the right kind of content in front of the right person at the right time. In today’s time, people have become smart enough not to be fooled by a salesperson. Even if you take people around you as an example, there are tiny percentages that answer the anonymous calls on their cell phones. The advanced technologies make it easy for people to directly block these numbers and never hear from them again. The buyers educate themselves through a variety of websites on the internet rather than going to a salesperson. They try to avoid them until the last minute of the buying. The buyers find it useful to contact the reliable sources and narrow down their options before catching up with the salespeople. The buyer has full control of the sales cycle. This is the reason why your organization should spend time in enabling the sales and organizing them with the buyers. To be a winning sales representative, you do not have to hunt down the leads and make them buy your product. Instead, you need to be the one who can discuss with the prospective customer and try to answer all their queries. This makes their decision-making process much more straightforward. You can achieve this if you have a keen interest in the understanding the buyer’s behavior. All you need to do is wait for the buyer to reach out to you, and when they do, just make sure your sales representative has all the information about the needs of the buyer. This is where you need sales enablement. Developing a great relationship with the customer is the prime motive of any business or organization. This is the principle of any business and needs some thorough research and understanding. Sales enablement is one such topic that requires a practical approach by the company for every customer. In this blog, you will understand more about sales enablement and how it is crucial in the modern business. A list of all the people who are the priority and whom they need to contact based on the purchase intent and the lead quality. The behavioral data of the customer that has all the summary of the intent and the prospect interest. A database or a library of all the content aligned in each stage of the buying process that helps in building a rapport and the trust with the customer. This helps you in encouraging the prospective customer to decide on the purchase. Advanced tools to help the sales team in alerting and tracking the best prospect customers about the numerous activities in the different stages of their buying process. 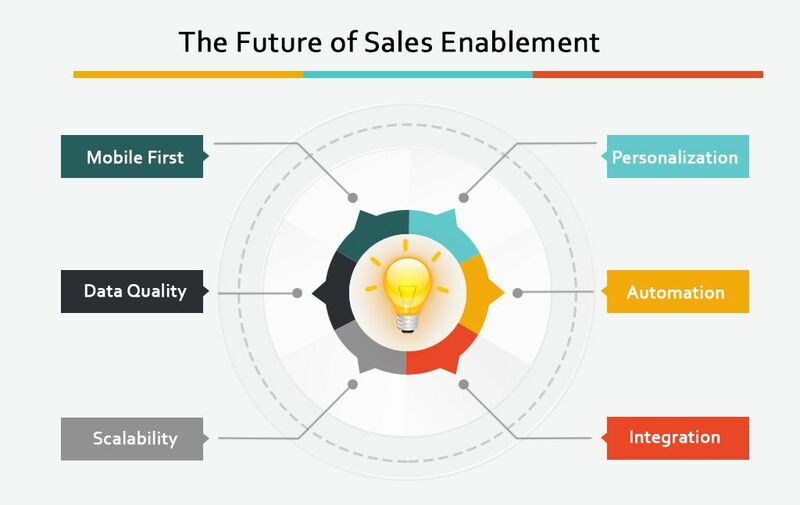 What is the need to understand sales enablement? The major factor in the success of a marketer is their ability to help their sales team in selling the products or services. The two essential elements in doing this are broadcasting content and knowledge. However, you might need a few more things along the way, but publishing content is a must. 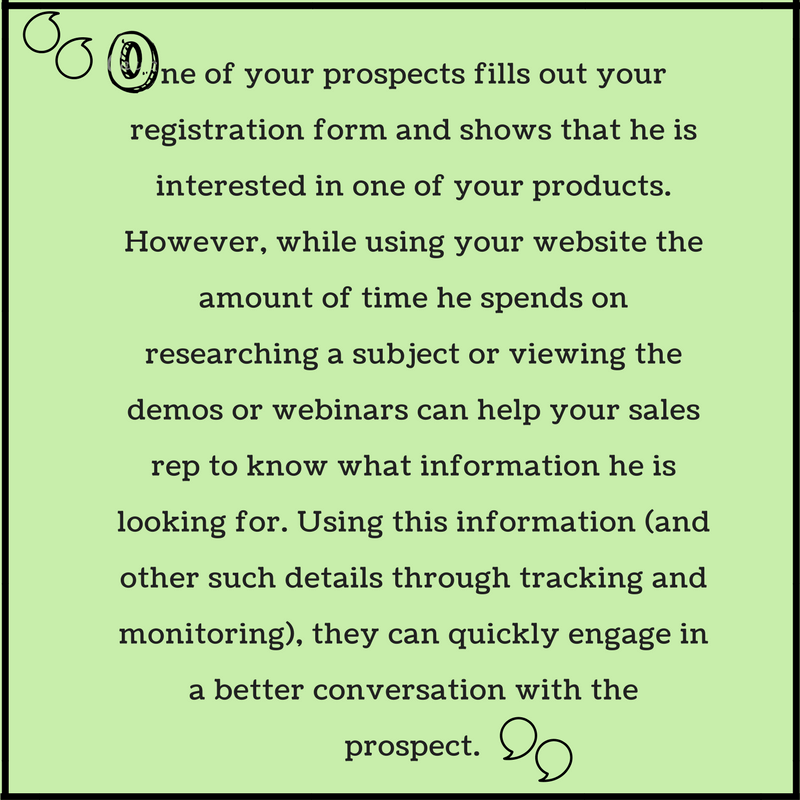 A salesperson uses most of his time in researching about the prospects who neither makes any purchases nor will move forward in the buying cycle. Only if you could help your representatives in determining the exact concern of the prospect, they can make their communications smartly. Also, if you provide your sales reps the required tools and technologies, it would help them in keeping in touch with the prospects easily. This, in turn, helps your sales team in building better relationships with the prospects and in guiding them throughout the buying process with the help of sales tactics. This would enhance your value. The question remains why your company should understand sales enablement? The simplest answer to this is that if your organization is spending a huge chunk of funds in the sales and marketing sector, they would want to get some results from it. The primary motive of the sales enablement is to help the marketing team to forward the most efficient, and high quality leads to the sales team. Therefore the sales representatives can spend their time focusing on the top priority buyers. This helps in making a more predictable and steady pipeline. Another advantage is that if your sales team is getting more results than they ever expected, they will gladly like to work with the organization. With this, it will be easy to understand how pipelines can be created just by translating the marketing demands and how to improve the revenues by improving the conversion rates. Getting to know the prospects and identify the behaviors that make them a promising client. Helping the sales reps by giving them all the resources and topics they should be working on. These topics should be designed in a way to help them engage effectively with the buyers. Giving proper information to the sales team so that they can instantly access and customize it as per the customer’s requirement. Interacting with the sales team and providing them with all the knowledge about the tools that they can use to track the customer activities all throughout the buying process. When your organization practices sales enablement, you are very likely to increase sales and help them thrive. However, the success of your company depends on the fundamental understanding of your buyer’s interaction with your campaigns, content and the website. Generating high-quality leads is just the first step in the cycle. However, the most significant step is to provide the sales team with all the vital information that they need to seal the deal. This means that the sales reps should identify the intent and interest of the prospect depending on the activities they perform on your website. Every company should acknowledge that it is important to understand the prospect and customer behavior more than just the demographics. Let me explain this with an example as described below. 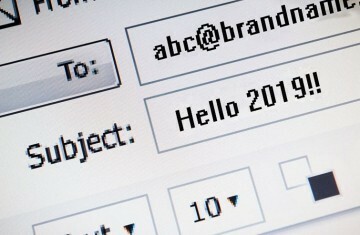 With the technology of marketing automation, you can make a natural connection between the marketing and sales database. It can be used to connect the sales and marketing activities. This, in turn, also gives a boost to your business. Either CRM (customer relationship management) or SFA (Sales Force Automation) can be used to manage sales movement and also to keep track of the activities of the buyers. The other activities associated with the CRM and SFA are forecast modeling, lead routing, and disposition. Keeping a tab on the online activities of the prospect and understanding their needs and interest. With this knowledge, the salesperson can communicate with the buyer on the topics that they can relate to. Sending instant real-time emails to the sales team when the prospect visits the website. This is usually done after identifying the activity of the prospect on the website. Every company has criteria to determine a hot prospect. Emailing the report of the activities of the prospect on the website and elsewhere to the sales team so that they can keep a tab on the important contacts, and leads. Giving the sales team the access to the prebuilt templates that can be customized to track the response of the recipient directly through their emails. This is for the marketing team. There is much information that the marketing team collects by following the activity of the leads that can be of great help to the sales team. Most of this information go to waste since the sales team does not get it. Hence it is important to organize the information in a way that the sales team gets all of it on time. The second thing is to make the whole process as convenient as possible. Use tools that are easy to understand and manage the sales team. Make sure you incorporate some of the proven sales techniques. Talk to your top sales representatives and ask them about the techniques and methods they use. Share these techniques with the other sales representatives of the company to get the best results. Put the important facts about the company and attach the link to the ‘about us’ page. 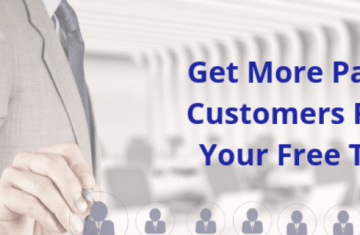 Create customized messages that relate to the pain of the customer. If you provide an online demo, then insert a link to the online demo in your email template. Before rolling out any tool or techniques, test it out on a small group of representatives. Make sure to correct all the flaws and then share it with the entire team. Do not force the sales reps to adopt the tool. Show them the importance and the advantages of the tool and only then ask them whether they would be interested in implementing it. Sales enablement is a relatively new concept, but it is pretty useful in increasing the sales of your company. 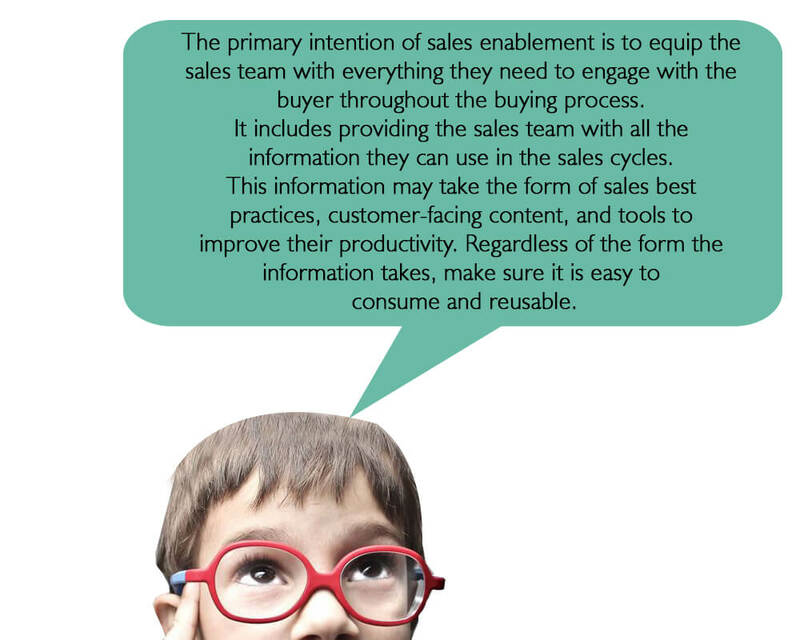 However, it is always good to think ahead of time and comprehend what sales enablement holds for us. Social media is growing every day. Hence the integration of the CRM with social networks does not sound impossible. Many prospects use social networks to make their buying decisions. Thus, in future, the combination of the CRM with the social media will be a huge element in the picture. Responding to the prospect as quickly as possible is the best way to boost sales. Hence providing faster responses will be the next step in the sales enablement. The sales team will have to be equipped with sufficient information about the lead to know their online behavior and give them a reply instantly. Sales representatives always want to shorten the sales cycle and seal the deal as soon as possible. In the next step, they wish to predict the future actions of the lead depending on their activities and the response of the buyers to your website and content. Did I tell you that about 67% buyer’s journey happen digitally and 57% of the purchase decision is done even before the salesperson talks to your customer? Hence, it is vital for the sales representative to have all the information. This would help him to have a seamless conversation with the customer. Note that the prospects are contacting you to solve their problems and not to buy your product. Hence to improve the odds of scoring the customers, the information shared during the hand-off should be improved. The history of activities and the content accessed by the prospect. All the details of the problem to solution scenario of the prospect. Interesting topics for conversations based on the interest of the prospect. Stories of other customers that are related to the problem and the interest of the prospect. All the information and strategy created by you should be based on the interest of the prospect and his perspective. Additionally, it is also essential to get timely feedback from the salesperson on what is working and what is not. This will be helpful in evaluating and improving the tools and the techniques. 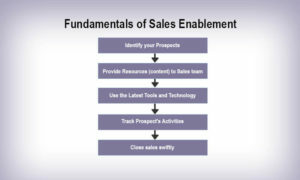 By now I hope you know what sales enablement is and how its importance in the growth of your company. 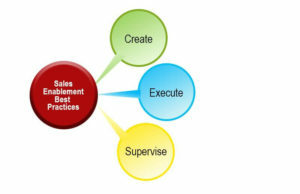 You can now implement the sales enablement program in your company. Don’t forget to use guidelines and techniques given above to get your marketing and sales team in sync. Another important thing is to improve information sharing and communication to build relationships with your leads. Prem is the CEO of Aritic Suite with a demonstrated history of working in the computer software industry. Currently, he is venturing, exploring and learning the SaaS software world on Aritic Micro Service with Aritic Products. He loves playing cricket when he is not coding. Hi Prem, Thanks for sharing such great strategies for sales enablement, all the points that you discussed in this article are entirely applicable. To enhance the productivity of every sales team, sales enablement is the best-in-class strategy. Thanks for updating this blog! Great blog, Prem. Thanks a lot for sharing the article about the sales enablement as it is the most vital element in the growth of a company. Thanks, Prem I enjoyed reading your article. These will prove to be helpful for every business organisations. Reading the blog about the sales enablement was interesting. Thanks, Prem for putting light on this topic so that to convert. Sales enablement is the best-in-class effective strategy to increase the productivity of the sales team, and we thank the Aritic team for putting light on this topic so that to convert valuable conversations with qualified leads. You have extensively described this. Sales enablement strengthens the link between sales and marketing to increase sales effectiveness, and generate a higher return on ROI – all superstar outcomes worthy of consideration and prioritization.